The Fourth Industrial Revolution was heralded in with Klaus Schwab, the World Economic Forum’s Executive Chairman, warning that the current breakthroughs disrupting almost every industry in every country were sweeping across at unprecedented speeds. “The breadth and depth of these changes herald the transformation of entire systems of production, management, and governance,” he said, pointing out just how important ‘innovation’ had become to the world economy. This is evident in everything that surrounds us today: The vast range of new technologies fusing the material, digital and biological worlds and blurring the boundaries between disciplines has had a huge impact on economies and industries worldwide, even challenging our idea of what it means to be human. For the business of fashion, these tides have swept in with wearable technologies that bridge our very senses with materials, retail practices built on ease, consumers calling for brands that centre values like inclusivity, sustainability and transparency, amongst many more. But, for Lankan apparel, how does this translate? An industry with both the manufacturing power and the creative capital, at the crossroads of old and new worlds. Beyond the textbook solutions made for retail sectors, or the makers’-only sensibilities, Sri Lankan apparel needs a middle-ground, a game-plan of its own. One that draws from the unlimited potential held by a fluid fashion business model that flows from manufacturer and stakeholder to retailer. This is where the most inspiring annual gathering of the apparel industry comes in. This is where the 2018 edition of the South Asian Apparel Leadership Forum leads the conversation to where Lankan apparel meets design, tech and innovation. The forum will focus on the unique ways that these transitions in global fashion will affect Sri Lanka. Ideas like the global trend towards increasingly nimble, innovative and adaptable industries emulating product-service business models, and their needs for versatile, technologically-minded professionals with design, innovation and entrepreneurial skills will be explored. The conference will be welcomed by its founder Linda Speldewinde, with opening remarks by Conference Co-chairs Kurt Cavano, SVP and GM at GT Nexus, and Kumar Mirchandani, MD at Favourite Group. It’s almost a tradition at South Asian Apparel Leadership Forum to always start with a supercharged session from the world’s premier economic and fashion business trend forecasters—The Future Laboratory. Its founders, Chris Sanderson and Martin Raymond, will reveal how our concept of morality is undergoing a paradigm shift, challenged daily by changing value codes and brand intimacies that are welcome to some but intrusive and threatening to others. These world-renowned foresight specialists will discuss how we define morality in the age of big data; why branded intimacy is growing and what businesses and corporations need to do to adapt to a consumer landscape where materialism is no longer the priority. Sri Lanka’s apparel industry has adopted narrow and deep strategies developing meaningful relationships with influential brands from around the world. But, as complete market shifts take place rendering existing business models of its partner brands obsolete, how does one adapt to this future? Surveying the retail landscape from the perspective of the Americas Apparel Producers Network (AAPN), President and AAPN and Chief Sourcing and Merchandising Officer at Haggar Clothing Co, USA, Anthony Anzovino, shares cutting-edge insights on retail performance, predicting the winners and the losers in the long-haul. 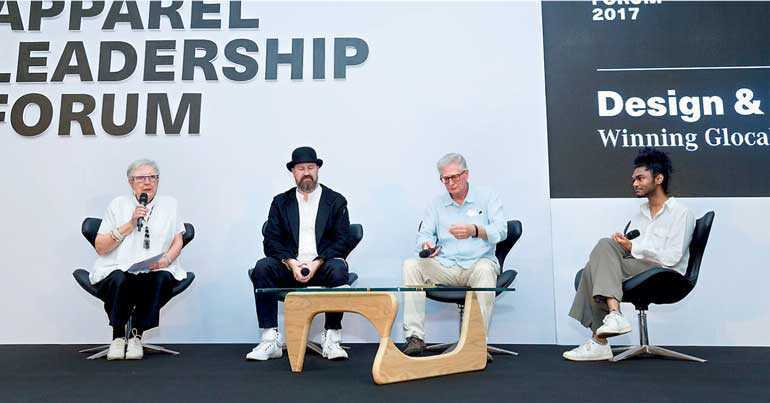 Bringing in essential insights from those at the forefront of the fashion value chain. the South Asian Apparel Leadership Forum 2018 will have Rajiv Sharma, Group CEO of Coats Thread, discuss how the Fourth Industrial Revolution will play out for the fashion business, and who will draw out the benefits best. From Coats’ vantage that comes from a massive global footprint, a long history and first-hand experience of transitioning economies, the company has an unparalleled view of where breathtaking advancements will happen and who is well positioned to reap the rewards or bear the brunt of its disruption. Led by David Reay, Chairman of Northern Clothing and Textile Network in the UK, this session is an interesting one where an inspiring story of rebuilding it’s manufacturing on a highly technological proposition, seeking cross-industry experience from automotive industry will be shared from a deeply personal place. Reay will discuss how an apparel industry like Sri Lanka’s, with a like-minded technology mindset, could have the opportunity to partner or collaborate. An opportunity for not only the island’s large-scale manufacturers but also for small and medium manufacturers, opening up new avenues. Leaving behind the ‘copycat’ era, China is zooming ahead to become the tech superpower displacing the US. The Sino business culture today is led by innovation obsessed execs and their success has generated a virtual cycle of innovation. China has spawned a new generation of homegrown entrepreneurs who are creating world-class products, developing their own technologies, and rolling out new business models on a scale and with a speed the global economy has never seen. Ben Cavender, Principal of the China Market Research Group, and Prof. Patrick Gottelier of Studio Gottelier, DeTao Group, will dissect China’s macro landscape fuelling these initiatives and firm-level actions specific to design, technology and innovation. With the global markets looking for more meaningful purchases, design becomes the bridge between the brand and the consumer, linking up processes that benefit people, profit and the planet. Designer and serial entrepreneur, plus the winner of H&M Foundation’s Global Change award in 2016, Tjeerd Veenhoven has made it his business to use design thinking through innovation, research, design and collaborative process to transition towards a circular economy. Veenhoven’s session will be complemented by sustainability leaders fresh from the Sustainable Fashion Symposium which is also held as part of Mercedes-Benz Fashion Week. This will include Kate Heiny, Head of Global Sustainability at C&A, and the Chairperson at SAC, Rogier Van Mazijk who is the Investment Manager of ‘Fashion for Good’ and the Co-Chair of the Sustainable Fashion Symposium. Representing the Lankan apparel industry within this power-packed panel will be Nikhil Hirdaramani, Director of Sustainability at the Hirdaramani Group. What’s the role of education in future-proofing power industries like apparel? Immense, stresses Jane Rapley OBE, Professor Emerita at Central Saint Martins, UK, who believes that education should inspire and drive business. Academics par excellence, design entrepreneurs and talent scouts share their insights on morphing design careers and grooming talent for future-fit roles in this panel moderated by Rapley and featuring Burak Cakmak, Dean of Fashion at Parsons School of Design, US, Douglas Maclennan, former Design School Director of International Development at Northumbria University UK and Henrik Vibskov, Fashion Designer and Entrepreneur. In its eighth year, the South Asian Apparel Leadership Forum will bring together some of the brightest fashion, apparel, tech and value chain business minds to discuss and collaboratively bring innovative solutions to complex issues. The forum organisers and the partners of Mercedes-Benz Fashion Week hope to have the forum impacting not only commercial success of fashion and apparel business ventures, but also those impacting lives of people and societies globally, and building dialogue in the role of design thinking, technology and innovation as change-makers of industry. For more information and tickets, the South Asian Apparel Leadership forum secretariats are now open for more information at AOD on 0763427772 or 0115867772/3, boxoffice@aod.lk or www.aod.lk.